on ONE- 1 Clear Hair 3oz. Trial Sized bottle. 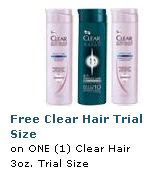 Click the link below to sign up for eOffers at Giant Eagle to get this free trial sized offer.